Although one might think that a single person may not wield the amount of power needed to shape themselves into brand , let alone become a brand of the nation - one man has certainly done the job and then some. In has recently been reported that U2's Bono, a man recognised by his name alone, spent St. Patrick’s Day in Kenya, where he attended a Pan African Media Conference to discuss important issues affecting the continent. “The conference attracted my attention because I am one of those who believe in brand Africa, a better Africa for Africans,” Bono explained. It seems Bono is continuing on his goodwill quest and a great flag flyer for brand Ireland, i do wonder though if he should maybe spread some of that goodwill here at home. Just a thought! 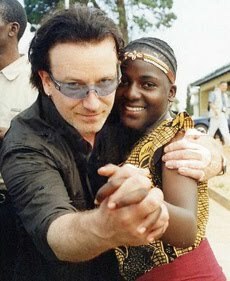 How and ever, keep it up Sir Bono, we salute you.